This was Michael’s industry demo that he shopped around to labels around the tiem that the Aunt Bettys were dropped by their label (not sure which happened first). This is a bit mellower than most Aunt Bettys songs, but still showcases Michael’s excellent songwriting abilities. 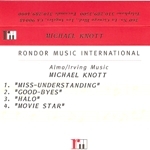 Michael Knott – Vocals, songwriter, ?